Neck pain is one of the most common complaints we see as Osteopaths. 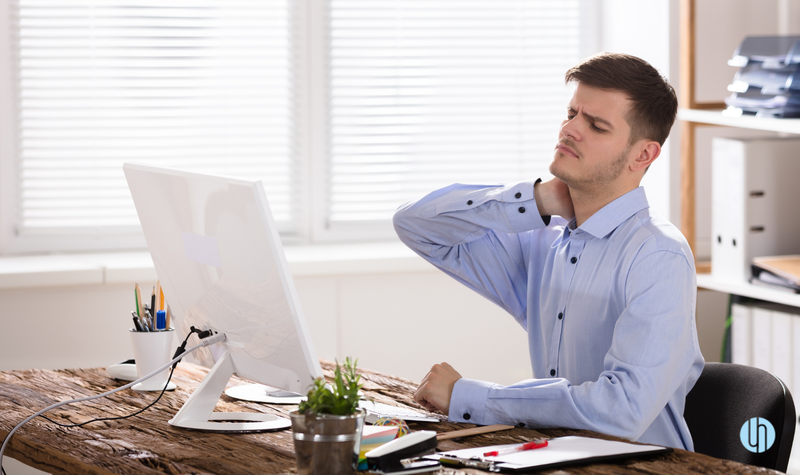 Unfortunately office and computer workers have the highest incidence of neck pain. Here we are going to explore the common causes of neck pain and how you can reduce the risks of experiencing neck pain. lead to muscular strains and headaches overtime. → Adjust chair height so knees are slightly above 90 degrees. Feet touching the floor. → Check your mouse set up- move your mouse closer to your body so your elbow is resting on your desk. With the ever increasing social media use, people tend to spend more time on their phones or tablets. Excessive phone usage can lead to neck pain as using our phone requires us to bend our head forward which can overstretch the muscles in our neck. Solution: Reducing phone use or bring the phone up to eye level as this reduces the strain on the neck. Carrying heavy hand bags can lead to neck pain. This is because when we carry our hand bag, we are carrying a load on one side of the body, which can shift the whole spine. As we carry the load, our body tries to compensate by activating the shoulder and neck muscles which can lead to neck pain over time. Solution: Ideally changing a handbag to a backpack is a great solution, the load will be evenly distributed on the back. Alternatively, only put light items in your handbag and swap sides regularly. Neck pain commonly affects tummy sleepers. When we sleep on our stomach, we rotate our head one way to breathe which can lead to neck pain often felt first thing in the morning. Solution: Changing sleep posture to lying on your side or back. Poor exercise techniques and lack of adequate warm-up can lead to neck pain and injuries. The spine of the neck (cervical) sits above the spine of our trunk (thoracics) and stiffness in the thoracic spine causes our neck to compensate and work more. Also lifting or training with poor technique can cause injury to the body. Solution: Do a proper warm up before working sets, and check that your lifting technique is correct. Working with a personal trainer can reduce your risk of injury. What to do if you’re suffering from neck pain? If you are still experiencing neck pain, then Osteopathy treatment may be for you. Your Osteopath will identify the cause of your neck pain, help give you relief with hands on treatment and create a plan with you to help prevent the recurrence of your neck pain. Book ONLINE today to help rid your ‘pain in the neck’.